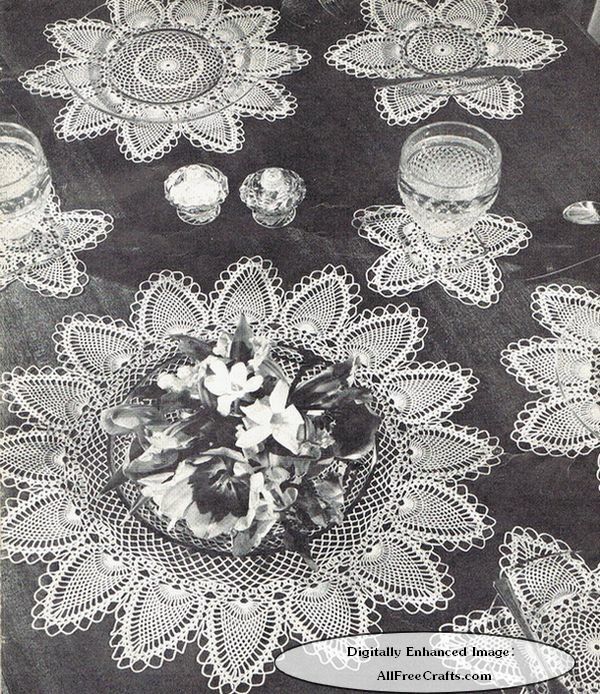 Vintage crocheted pineapple centerpiece pattern worked in modern thread. 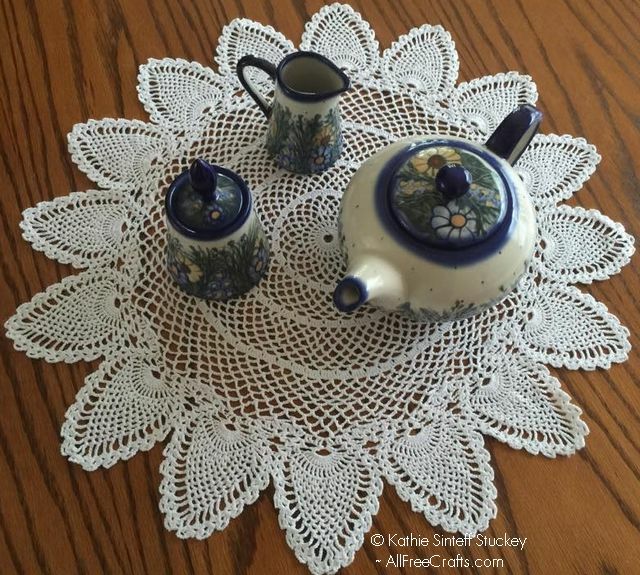 This lacy pineapple luncheon set is a vintage 1946 crochet pattern which includes a 16 inch diameter centerpiece; 12 inch place doily; 9 inch bread-and-butter doily and, to complete the set, a 6 inch glass doily. Free pattern instructions for all four set pieces are included here, along with digitally enhanced images scanned from the original vintage pattern booklet. 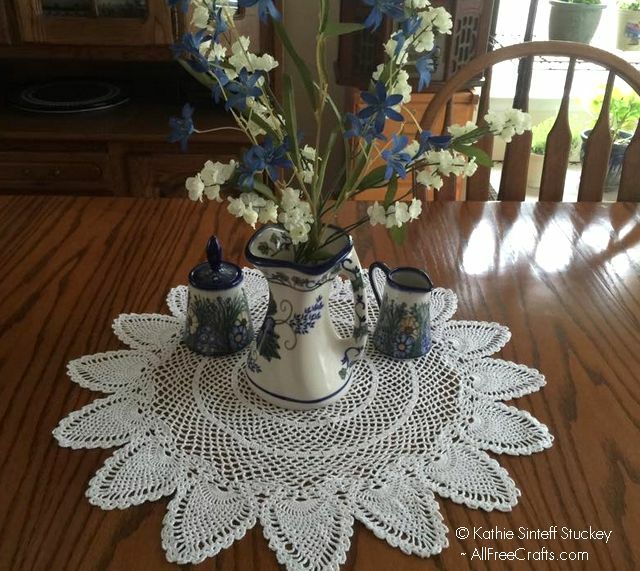 A Modern Take: I have added beautiful modern photos, courtesy of Kathie Sinteff Stuckey, who followed the centerpiece pattern, using a size 5 crochet hook and size 10 crochet thread. Her finished centerpiece, pictured in this post, measured 22 inches without the final looped edge. Please Note: Typed text, website code, and digitally enhanced images appearing here are protected by copyright and cannot be republished, except for personal use, without written permission from the Editor of AllFreeCrafts.com. MATERIALS: J. & P. COATS‘ Six Cord Mercer-Crochet, Size 30: Green Label: 4 balls of White or Ecru, or Blue Label: 16 balls of any color. J. & P. COATS OR CLARK’S O.N.T. BEST SIX CORD MERCERIZED CROCHET, Size 30: Small Ball: J. & P. COATS-ll balls of White or Ecru or 13 balls of any color, or CLARK’S O.N.T.-8 balls of White or Ecru, or 10 balls of any color. finished size, 22 inches, without final looped edging. Milward’s “Ship” Brand Steel Crochet Hook No. 10. CENTERPIECE … Starting at center, ch 10. Join with sl st to form ring. 1st rnd: Ch 3, 23 dc in ring. Sl st in 3rd st of ch-3. 2nd rnd: Ch 4, *dc in next dc, ch 1. Repeat from * around. Join last ch-1 with sl st to 3rd st of ch-4. 3rd rnd: Ch 5, * dc in next dc, ch 2. Repeat from * around. Sl st in 3rd st of ch-5. 4th rnd: Sc in next sp, *ch 5, sc in next sp. Repeat from * around, ending with ch 2, dec in lst sc. 5th and 6th rnds: *Ch 5, sc in next loop. Repeat from * around, ending with ch 2, dc in dc. 7th rnd: Repeat the 6th rnd, ending with ch 5, sl st in dc. 8th rnd: Sl st in next loop, ch 3, 4 dc in same loop, 5 dc in each loop around. Join. 9th rnd: *Ch 5, skip 2 dc, sc in next dc. Repeat from * around, ending with ch 2, dc at base of first ch-5 (40 loops). 10th to 13th rnds incl: * Ch 5, sc in next loop. Repeat from * around, ending with ch 2 dc in dc. 14th rnd: *Ch 5, sc in next loop. Repeat from * around. Join. 15th rnd: Repeat 8th rnd. 16th rnd: * (Ch 5, skip 2 dc, sc in next dc) 7 times; ch 5, skip 3 dc, sc in next dc. Repeat from * around, ending with ch 2, dc at base of starting ch-5 (64 loops). 17th to 22nd rnds incl: Repeat 10th rnd. 24th rnd: Repeat 8th rnd. 25th rnd: Repeat 9th rnd, skipping 3 dc (instead of 2) (80 loops). 26th to 29th rnds incl: Repeat 10th rnd. 30th to 33rd rnds incl: Repeat last rnd but make ch-6 loops on 30th and 31st rnds and ch-7 loops on 32nd and 33rd rnds. 35th rnd: Sl st in next loop, ch 3, in same loop make dc, ch 2, and 2 dc (shell made); in each loop around make 2 dc, ch 2 and 2 dc (another shell made). Join. 36th rnd: Sl st in next dc and in next sp, ch 3, in same sp make dc, ch 2 and 2 dc, * ch 1, in sp of next shell make 2 dc, ch 5 and 2 dc; ch 1, shell in sp of next shell (shell made over shell), (ch 3, sc in sp of next shell) twice; ch 3, shell over shell. Repeat from * around. Join. 37th rnd: Sl st in next dc and in next sp, ch 3 and complete shell, * 15 tr in next ch-5 sp, shell over shell, ch 3, (sc in next ch-3 sp) 3 times; ch 3, shell over shell. Repeat from * around. Join. 38th rnd: * Shell over shell, (tr in next tr, ch 1) 14 times, tr in next tr, shell over shell, ch 1. Repeat from * around. Join. 39th rnd: * Shell over shell, ch 2, sc in next ch-1 sp (between tr’s), (ch 3, sc in next ch-1 sp) 13 times; ch 2, shell over shell. Repeat from * around. Join. 40th rnd: * Shell over shell, ch 4, sc in next ch-3 loop, (ch 3, sc in next loop) 12 times; ch 4, shell over shell. Repeat from * around. Join. 41st rnd: * Shell over shell, ch 4, sc in next ch-3 loop, (ch 3, sc in next loop) 11 times; ch 4, shell over shell. Repeat from * around. Join. 1st row: Shell over shell, ch 4, sc in next ch-3 loop, (ch 3, sc in next loop) 10 times; ch 4, shell over shell. Ch 5, turn. 2nd row: Shell over shell, ch 4, sc in next ch-3 loop, (ch 3, sc in next loop) 9 times; ch 4, shell over shell. Ch 5, turn. Repeat the 2nd row, having 1 loop less on each row until 1 loop remains. Ch 5, turn. Next row: Shell over shell, ch 4, sc in next loop, ch 4, 2 dc in sp of next shell, ch 1, sl st in sp of last shell made, ch 1, 2 dc where last 2 dc were made. Ch 5, turn and sl st in joining of shells. Break off. Attach thread in sp of next shell, ch 3, in same sp make dc, ch 2 and 2 dc; ch 4, sc in next ch-3 loop, (ch 3, sc in next loop) 10 times; ch 4, shell over shell. Ch 5, turn. Complete as for First Pineapple. Work other pineapples to correspond. Attach thread to free loop at point, (ch 10, sc in next ch-5 loop) 5 times; * ch 5, sc between the 2 shells at base of points, ch 5, sc in next free loop, (ch 10, sc in next loop) 10 times. Repeat from * around. Join and break off. Work as for Centerpiece until 14 rnds are complete. 15th rnd: Repeat 35th rnd of Centerpiece (40 shells). 16th rnd: Sl st in next dc and in next sp, ch 3, in same sp make dc, ch 2 and 2 dc, * ch 1, in sp of next shell make 2 dc, ch 5 and 2 dc; ch 1, shell in sp of next shell, ch 3, sc in sp of next shell, ch 3,, shell over next shell. Repeat from * around. Join. 17th rnd: * Shell over shell, 15 tr in ch-5 sp, shell over shell, ch 2, (sc in next sp) twice; ch 2. Repeat from * around. Join. 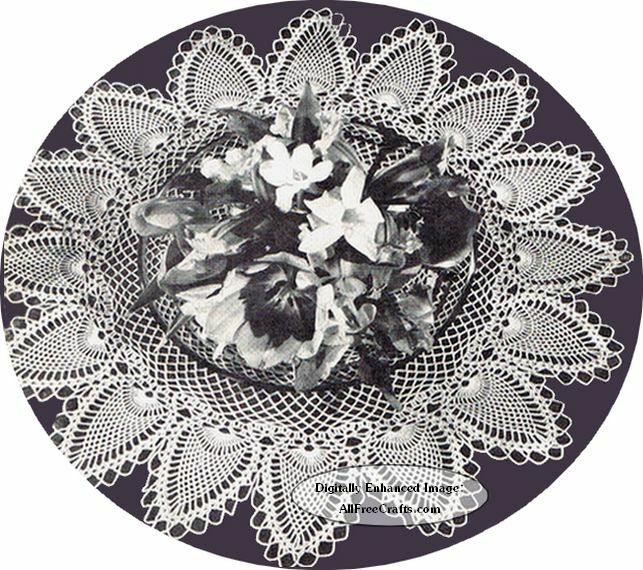 Complete doily as for Centerpiece, starting at the 38th rnd. Work as for Centerpiece until 7 rnds are complete. 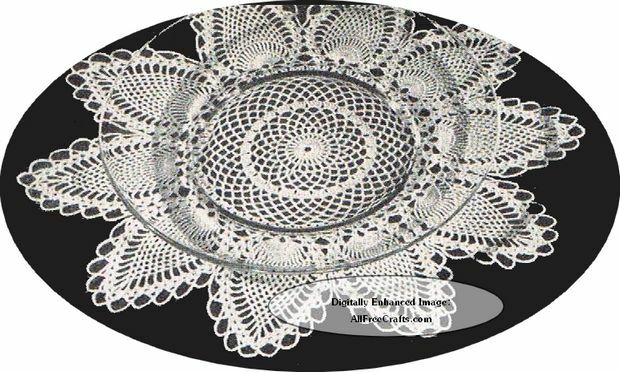 Complete as for Place Doily, starting at the 15th rnd. Starting at center, ch 8. Join. 1st rnd: Ch 3, 19 dc in ring. Join. 2nd, 3rd and 4th rnds: Repeat 2nd, 3rd and 4th rnds of Centerpiece. 5th rnd: Ch 3, in last loop make dc, ch 2 and 2 dc; shell in each loop around (20 shells). Join. 6th rnd: Repeat 16th rnd of Place Doily. 7th rnd: Repeat 17th rnd of Place Doily, having 10 tr (instead of 15 tr) in each ch-5 sp. 8th rnd: * Shell over shell, (tr in next tr, ch 1) 9 times; tr in next tr, shell over shell. Repeat from * around. Join. 9th rnd: * Shell over shell, ch 2, sc in next ch-1 sp between tr’s, (ch 3, sc in next ch-1 sp) 8 times; ch 2, shell over shell. Repeat from * around. Join. 10th rnd: * Shell over shell, ch 4, sc in next ch-3 loop, (ch 3, sc in next loop) 7 times; ch 4, shell over shell. Repeat from * around. Join. 1st row: Shell over shell, ch 4, sc in next ch-3 loop, (ch 3, sc in next loop) 6 times; ch 4, shell over shell. Ch 5, turn. 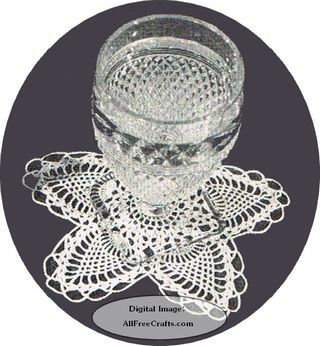 Complete as for First Pineapple of Place Doily. Make 5 more pineapples like this. Work Edging as for other doilies.